Part comedy and part social commentary, that’s the combination that writer/director Sloan Copeland’s award-winning comedy, Wet Behind the Ears, has been pleasing audiences with as it has racked up one festival win after another. Word arrived this past week from Cinema Libre that July 22 will be the domestic DVD release date. Take note, this is an indie film that should be on everyone’s must-see list this summer … seriously! The harsh reality of getting a college education that brings with it a mountain of student loan debt and a degree that has little or no value in the workplace (“I really don’t have any room on my staff for a zero, real-world experience, entry-level position”) is at the core of this comedy starring Margaret Keane Williams as Samantha, a recent college graduate. This is not only Williams feature film debut (some TV and short film work), but she also crafted the script with filmmaker Sloan Copeland and acted as the executive producer. We suspect that the backstory to this film — which rings so very true — has much to do with Williams own experiences in the workplace. If you can’t find the dream … get out there and make your own dreams! As for her character in the film, after finding no offers — and out of money — the harsh reality of starting a career without experience sets in and she is forced to move back in with her parents. To make matters worse, to make ends meet Samantha ends up taking a job at the local ice cream parlor. Not exactly what she had in mind for herself when she donned the cap and gown, walked across the stage and received the hardy handshake and her college degree! Samantha is not alone in her post-college dose of cold-water-in-the-face reality as her friend Vicky (Jessica Piervicenti) is also up against the “teaching experience” that a good school and good grades don’t necessarily prepare one for anything more than a bartending or food service job. Their plans of rooming together quickly go up in smoke. That’s the backbone of the story arc here … college grad meets real world. Now Copeland and Williams could have told this story as a straight up drama — a message film — but instead opted for humor, which makes Wet Behind the Ears both enjoyable and approachable … and ultimately a winner. In a word, it’s the “journey,” not the outcome (unexpected twists and turns) that becomes the message here. You have to take control, no one is going to do it for you. And, if the truth be-known, if this were a “resume” for actors Margaret Keane Williams and Jessica Piervicenti, then you can expect to see both of them in bigger films in the years ahead. Piervicenti is just naturally funny and Williams is out-and-out smart. With that July 22 street date, Cinema Libre has time to get out there and work this one. Acting, directing and all tech elements are all well beyond indie film expectations … no word just yet on any bonus features included with the DVD release. 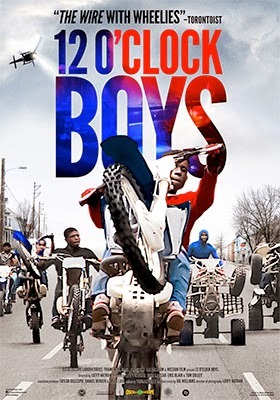 Oscilloscope Laboratories has tabbed Aug. 5 for Blu-ray and DVD editions of documentary filmmaker Lotfy Nathan’s 12 O’Clock Boys, a unique look at a group of Baltimore teens who are outlaws, gang members and dirt bike legends. A brief theatrical showcase run generated ticket sales of $44,108 … the ARR comes in at 186 days. In FilmWorks Entertainment’s recent DVD release (Apr. 22) of Chris Kitchen’s Freedom Riders, he detailed how a group of bike riders defied the U.S Forest Service to blaze trails through the rugged Teton Pass area of Wyoming. They had a passion … and lived it, regardless of the consequences. With these Baltimore teens, known as the “12 O’Clock Boys,” they too defy the authorities with their equally passionate love of dirt bikes, but their thrill-rides are not in some remote forest, but on the gritty streets of Baltimore. They’ve learned that cutting in out of traffic at breakneck speeds will not bring the police down on them since there is a prohibition against giving chase out fear of making their death-defying stunts even more dangerous — not only to themselves, but to the public in general. 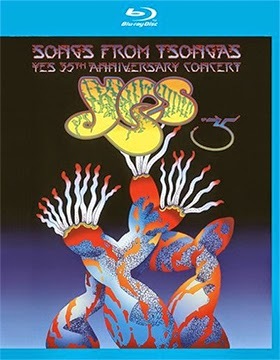 Eagle Rock Entertainment has tabbed Sept. 23 as the street date for Blu-ray and double-disc DVD editions of Yes: Songs From Tsongas – 35th Anniversary Tour. First up is the 2004 Yes concert at Tsongas Arena in Lowell, MA., which makes its way to Blu-ray and features the last time that Rick Wakeman, Jon Anderson, Steve Howe, Chris Squire and Alan White were to reunite and perform together. Bonus nuggets included here are the bonus track “Ritual” and an interview with Yes album cover artist Roger Dean. 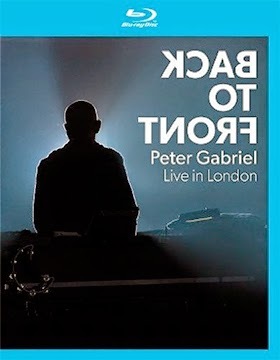 On June 24 there will be a four SKU offering of Peter Gabriel: Back to Front – Live in London ... included are both stand-alone DVD and Blu-ray editions, plus two DVD/two CD and two Blu-ray/two CD Combo Packs. The bonus discs for both the DVD and Blu-ray “Deluxe Editions” includes the theatrical release version of Back to Front and features additional interviews and “montage” versions of both “Solsbury Hill” and “Sledgehammer,” plus these “Deluxe Editions” include a 60-page hardback photobook. If you are looking for an urbane comedy, with subtle humor and witty dialog that brings a slight smile to your face … look elsewhere. But if you want FUNNY, then Indican Pictures has lined up two comedies that are going to be right up your alley. Poor taste, vulgar humor, sight gags and packed with laughs are exactly what director David Greenspan’s 51/50 Mall Cop (May 25) and filmmaker Brian O’Connell’s Angry White Man (June 24) deliver!!! Frank (Derek Cecil — House of Cards, Banshee, Treme) is a mall cop. Actually, more like a night watchman at an Albuquerque shopping mall, who has a tragic accident one night when chasing a would-be burglar through a plate glass window. Skip ahead six months and we once again meet up with Frank, a one-armed Frank, back for a visit (a little bit of nostalgia) at the place where he used to call home, the mall. He’s had no luck finding a new job (he was right handed and all of the employment applications that he fills out look like they were written by a chicken) and so he drops by to hook up with the old gang … and to meet his replacement. 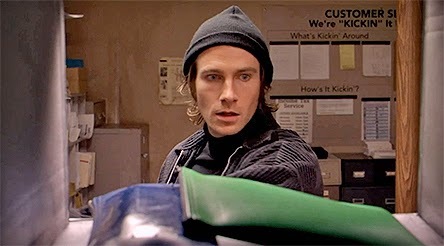 In short order he falls in love with Donna (Kathleen Robertson), his replacement, and hits upon a scheme to rob the place! But he has to outwit mall cop White Wedding (seriously), played by Nick Searcy, and keep Chris, the record store sales clerk (Jennifer Morrison) from seducing Donna … and do all of this with just one arm!! 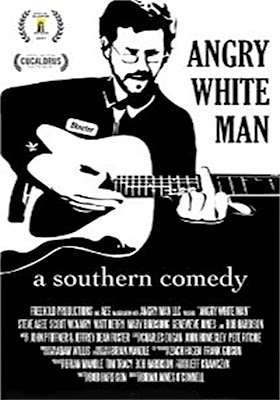 In Angry White Man, due in stores on June 24, we have the story of a man following his dream of becoming a country singer. It’s a hard road, especially if you don’t have much in the way of talent. Skeeter (Bob Hardison) is a good old boy who is down on his luck. You know that old joke, “What do you get when you play a country song backwards?” The answer is: “You get your house back, your wife back, your dog back and your truck back.” Well, that pretty much sums up Skeeter. His would-be bride has dumped him, he drinks too much beer and work is something of mystery. But when he invites a black Jehovah's Witness into his home for a little one-on-one (including a couple of bong hits) he suddenly sees the light and wants to follow his dream … go to Nashville, meet the great Bulldog Hays (Matt Berry) and launch his own singing career. 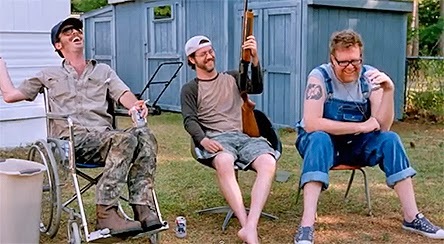 With help of his drinking, gun-toting and joke telling buddies (“would you rather be a gay black dude or a Jewish midget?”) Walt (Scoot McNairy) and Floyd (Steve Agee), a road trip (like none other) is planned. Along the way they will encounter ugly women, drunk women and naked women, but Skeeter will not be detoured, he will find that stage and sing his songs! 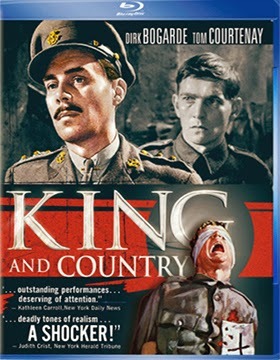 VCI Entertainment will be bringing both DVD and Blu-ray editions of director Joseph Losey’s 1964 (1965 for domestic theatrical) film, King & Country, to market on July 15. You cannot mention Tom Courtenay without first thinking of director Tony Richard’s 1962 landmark British “Kitchen Sink” film, The Loneliness of the Long Distance Runner. That film literally sent him to the front of the line in terms of must-have actors, which leads us to Losey’s film adaptation of J.L. Hinton’s novel, “Return To The Wood,” which was subsequently adapted as a play and the film King & Country. Courtenay is Pvt. Arthur Hamp, the lone survivor of a British unit on the Western Front (in this case, Belguim), who is reassigned. One day he just snaps and decides to go home. Found wandering by MPs, Hamp is arrested, charged with desertion and court-martialed, with a clearly out-of-touch Capt. 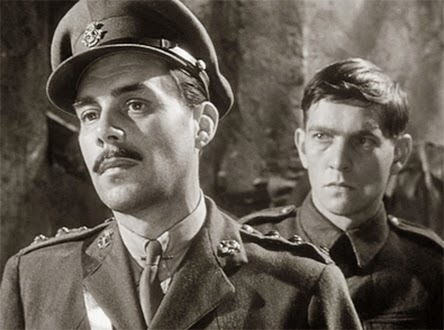 Hargreaves (played by Dirk Bogarde) placed in charge of his defense. As the trial progress (and the foregone outcome of it becomes clear), Hargreaves has a change of heart and realizes that Hamp has no business being back at the front after the ordeal that he had been through with his first unit. His honor; his duty, but the trial is a sham. 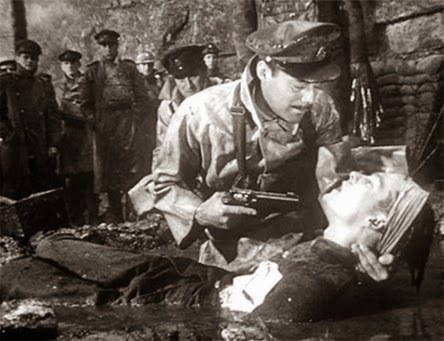 Nevertheless, examples must be made, Hamp is guilty and, much like Corporal Paris and Privates Ferol and Arnaud from Paths of Glory, he is taken out and shot. But he doesn’t die … what follows is justice run amok. King & Country remains as powerful today (if very much overlooked) as it was when first screened at the New York Film Festival. The post-war British class issues (a common theme) are clear and the weariness of war are evident … bravo to VCI Entertainment for releasing this gem on both Blu-ray and DVD. Also on the release schedule during the month of July are the July 1 DVD release of Survival: TV Series Collection Volume One (a ten-episode selection), I Married Joan: Classic TV Collection #3 and Loyola, The Soldier Saint (both available on July 8) and on July 15 look for the DVD release of original Spanish-language version of director René Cardona’s Night of the Bloody Apes, La Horripilante Bestia Humana, starring Norma Lazareno as Lucy, a masked wrestler very much in the spirit of Santo. 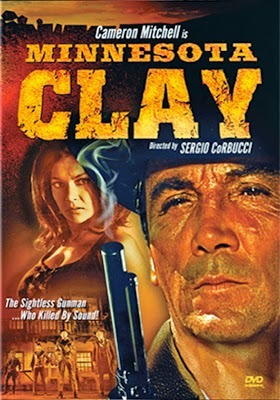 Lastly, July 22 brings DVD releases of the 1964 Spaghetti Western Minnesota Clay, starring Cameron Mitchell and filmed in Spain and a ten-episode presentation of The Star and the Story Collection, Volume One (circa 1955 and hosted by Henry Fonda). The much-anticipated and long-awaited third “Looney Tunes” Blu-ray collection will finally makes its way to eager fans on Aug. 12. 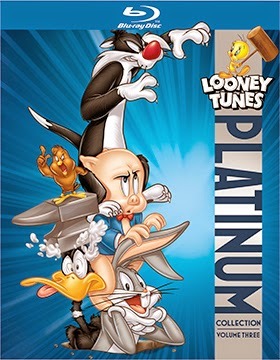 Warner Home Video will be releasing Looney Tunes Platinum Collection Volume 3 on that date … a three-disc assembly of 50 classic theatrical cartoons, ranging from Hiawatha's Rabbit Hunt (1941), Operation: Rabbit (1952) and Acrobatty Bunny (1946) to Nelly's Folly (1961), Nasty Quacks (1945) and more! Also include are “five hours” of bonus materials, 26 commentary tracks, additional rare shorts, featurettes and more! 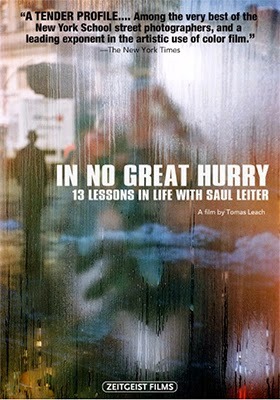 The late Saul Leiter, one of the founding members of the New York School of photography (“street photographers”), is the subject of documentary filmmaker Tomas Leach’s In No Great Hurry: 13 Lessons in Life with Saul Leiter. Zeitgeist Films announced this past week that Leach’s film will be heading to DVD on July 29 (a limited arthouse runs yields an ARR of 207 days). It is deft blend of history, conversations with Leiter prior to his death in November of last year and breathtaking examples of his work. Bonuses include additional interviews not included in the film’s final cut. It was revealed this past week that Molly, Gil and the rest of the Nick Jr. Bubble Guppies have a July 29 DVD date on the release calendar courtesy of Paramount Home Media Distribution. Titled Bubble Guppies Get Ready for School, this DVD episode compilation features over two hours of animated fun in the underwater city of Bubbletucky. Virgil Films & Entertainment has announced a trio of new documentary releases that will be making their way to the DVD market place during the month of July. 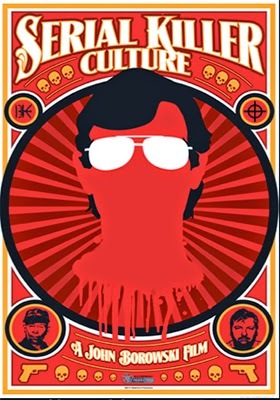 Heading home on July 8 is documentary filmmaker John Borowski’s latest, Serial Killer Culture, which is a great companion piece to his earlier documentary release, H.H. Holmes: America's First Serial Killer (also released on DVD by Virgil Films earlier this year). Borowski examines the creepiness factor of serial killers and, as Borowski put’s it, “their impact on pop culture, including artists who are inspired to create art based on serial killers.” If you think about it, that’s almost (not quite, but close) as sick as the crazies who engage in mass murder. The other aspect of Borowski’s focus in Serial Killer Culture is the historical significance of evidence, memorabilia and artifacts of the actual serial killers, so that experts (from all disciplines) can have a clearer understanding of what makes them tick. 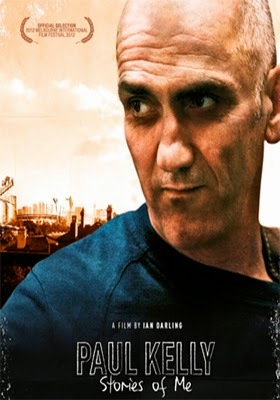 The following week, July 15, we shift to the land Down Under and documentary filmmaker Ian Darling’s award-winning tribute to singer/songwriter Paul Kelly in the film titled Paul Kelly: Stories of Me. Celebrated as an iconic treasure in Australia — a career of over 30 years as a musician, singer, poet and songwriter (over 350 published works) — Kelly is perhaps not as well known to American audiences. This documentary on his life — history, ups, downs and successes — could go a long way in exposing Paul Kelly’s body of work to the world beyond Australia. Interviews include members of his family, plus friends and colleagues … all mixed together with both vintage and full concert presentations of his music. Well worth a look. 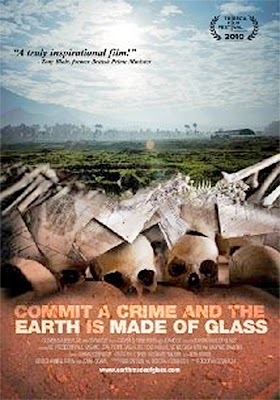 Lastly, and also streeting on July 15, is documentary filmmaker Deborah Scranton’s Peabody Award-winning film, Earth Made of Glass. The horror of the 1994 Rwandan genocide has been chronicled in both director Terry George’s Hotel Rwanda (Best Actor nomination for Don Cheadle and Best Supporting Actress nomination for Sophie Okonedo) and Sometimes in April (among others). Earth Made of Glass, looks back at the events of that spring and summer (from a distance) and blends two post-script stories together … one large (and damning) and one heartfelt. At one end of the spectrum is the exposure by Rwandan President Paul Kagame in 2008 of the French government’s role in supporting the militant Hutus against the Tutsis. Counterpoint to this is the intimate look at genocide survivor Jean-Pierre Sagahutu, who concludes a 15-year search for the murderer of his father, eventually coming face to face with the man.